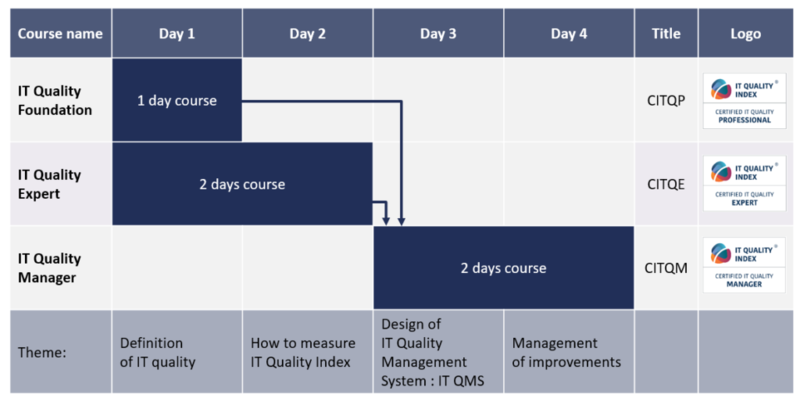 Course participants will gain knowledge of IT quality terms and how quality can be measured and tracked over time in an unbiased, objective way. This course provides an introductory overview to the IT Quality Index framework. It details the need for a holistic approach to IT quality and compares the new IT quality assessment with the operational ways of assessment with a focus on specific areas. This is a one-day Foundation course. All IT professionals including team leaders, CIOs, Senior IT managers, IT managers, Quality Assurance managers, Compliance leads and Supervisors. This qualification represents an overview of the IT Quality Index framework and the concept of quantifying the quality of IT into a management focused form. Course participants will gain knowledge of IT quality terms, how a new approach to strategic level quality assessments can improve the relationship between IT and the business through the alignment of differing perspectives into a single, objective view on the overall level of IT quality. Participants will learn the value of knowing the IT quality level, how the measurement of IT quality is organised, how outputs are processed and how the benchmarking of quality can be done. ITIL® Foundation certificate is highly recommended, however, not essential. There is no prereading associated with the IT Quality Foundation training session.